You sanctified Athos with the streams of your sweat. 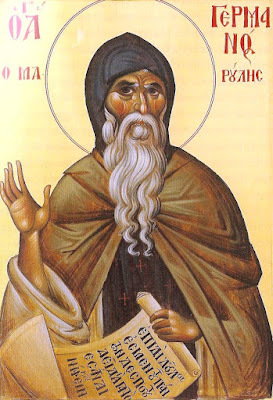 Venerable Germanos was born in Thessaloniki in 1252 to pious Christian parents, was the third of eight children, and baptized with the name George. From a young age he loved to pray, fast, keep vigil and help the unfortunate. Even as a child he would tell the workers in his household to rest from their labors, which his parents saw as a fruit of his love for his neighbor. When he matured his parents wanted to marry him off, but he was preparing to forsake the vanity of this world for the monastic life. One day the virtuous elder John came to Thessaloniki from the Athonite Monastery of Docheiarion, where he dwelt in a cell nearby. In 1270, as his beard began to grow, he followed Elder John upon his return to his cell at Mount Athos. By Elder John he was tonsured a monk and took the name Germanos. He was especially distinguished for his superhuman asceticism and humble obedience. For work he was a calligrapher. They would often go to Vatopaidi Monastery for divine services. Elder John and his disciple Gregory were martyred in Thessaloniki by the Latin-minded, and before his death he foretold the spiritual advancement of Germanos. 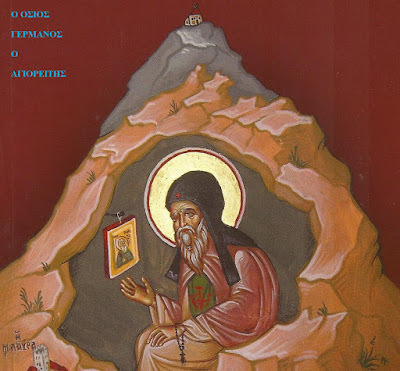 Germanos first went to Karyes, then to Great Lavra Monastery, where he dwelt nearby in the Cave of the Panagia under the obedience of Elder Job. Due to the disobedience of the monks, Job was exiled from the monastery shortly after he became abbot, and dwelt in a cave with Germanos. Soon after Germanos took as spiritual fathers Elders Myron, Malachi, Athanasios and Theodoritos. Before his life came to an end, Germanos took as disciples the disabled Ioannikios, after saving him through his prayers from certain death, as well as his ill nephew John and his ill relative Iakovos. At the age of 84, after a short illness, Germanos reposed in peace. His life was written by his friend Philotheos Kokkinos.